The Office of Student Activities provides many different opportunities for students to get involved on campus. The main goal of the Office of Student Activities is to provide students with educational, cultural and social programs. All of our programs are planned and implemented by students. The Office of Student Activities provides an environment for involvement, empowerment, and collaboration through student organizations, programmatic experiences, and shared governance. OSA maximizes the UA experience by advocating for all students, promoting intercultural understanding, and developing citizens who are prepared to positively impact their communities. To engage every student at the University of Arkansas. University Programs (UP) is a volunteer student organization responsible for coordinating and planning over 100 events annually for the campus community. University Programs provides UA students with cultural, educational, recreational, and entertainment experiences. Eight committees along with committee chairs and their executive officers select, schedule, and produce events such as concerts, movies, lectures, fine arts performances, and gallery exhibits. University Programs provides excellent opportunities to develop leadership skills and to gain practical experience in a variety of areas. Supported by an activity fee instituted in 1988, the events are free to the student body. Headliner Concerts Committee (HCC), which is composed primarily of students, gets to make the decision on what big-name artist to bring to campus each year. Because you have already paid a per-credit-hour fee to support this committee, when concert day arrives there is NO admission fee for students. Previous headliners include Grammy winning artists John Mayer, Foo Fighters, rapper T.I., Blake Shelton, Third Eye Blind, Snoop Dogg, The Flaming Lips, Kip Moore, and More! Who do you want to bring to campus? Take DLC's poll! Distinguished Lectures Committee (DLC) decides which dynamic and pertinent speakers to bring to the University of Arkansas campus. These speaking engagements are completely free to all students. Some of the speakers brought over the past few years have been President George H.W. Bush, CNN anchor Anderson Cooper, basketball icon Magic Johnson, author Malcolm Gladwell, Jane Goodall, His Holiness the Dalai Lama, Elie Wiesel, Steve Wozniak, and John Legend. The Associated Student Government shall act as an organized voice for all students of the University of Arkansas, to effectively represent students in the University's decision and policy making process and to provide a broad educational experience for students, while promoting citizenship on campus and in the greater community. 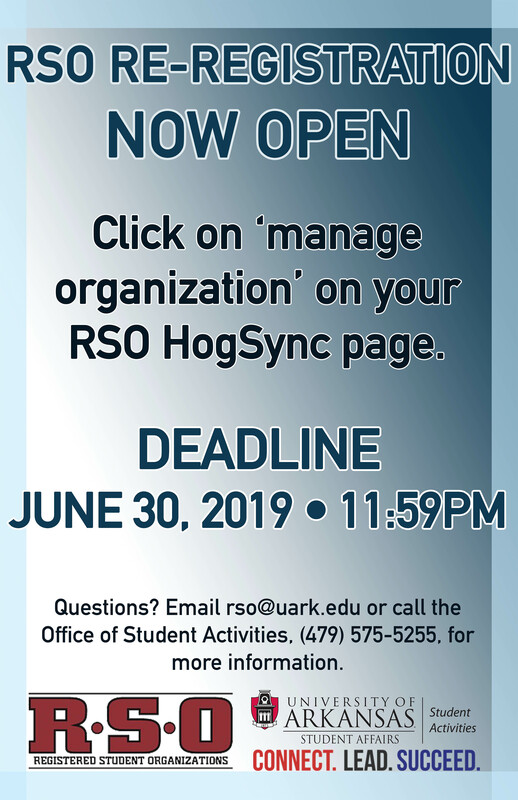 In doing so, ASG knowingly and responsibly recognizes the students' roles in the shared governance of the University of Arkansas. Did you know that there are about 400 Registered Student Organizations (RSOs) on campus? You'll make new friends, explore your interests, and have an unforgettable college experience as an RSO member. If you can't find an existing RSO that meets your interests, you can even start your own!